Why use the Equipd Bible? The Equipd Bible app has been carefully optimised for everyday tasks. Use it in the ministry, in meetings, for personal study. Are you learning a new language or working in a foreign-language field? Then the Equipd Bible will be of special interest to you. 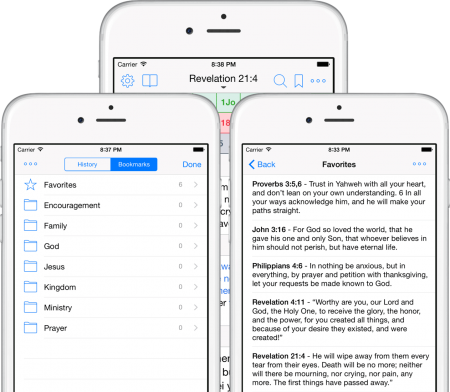 Did you read about the powerful new support for Bible Reading Schedules? Choose between multiple different schedules optimised to your study needs. Support for Daily and Weekly reading schedules complete with Meditation Prompts and Reminder Notifications. 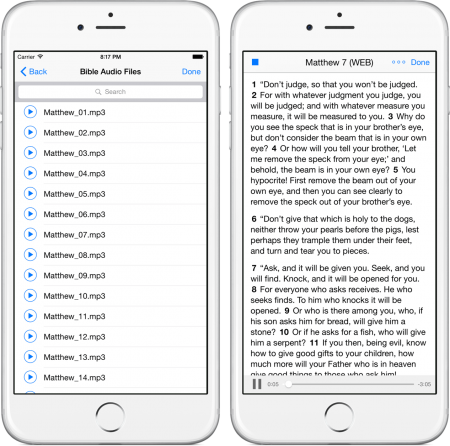 The Equipd Bible app is a specialized EPUB reader. Locate compatible EPUB files here, or on approved websites such as JW.org, and “Open in…” the Equipd Bible. Of course if you have the skillset you can always generate your own EPUB files! They must be compatible – make sure you use one of the default files as a working example of the file naming conventions and the HTML structure to adhere to. 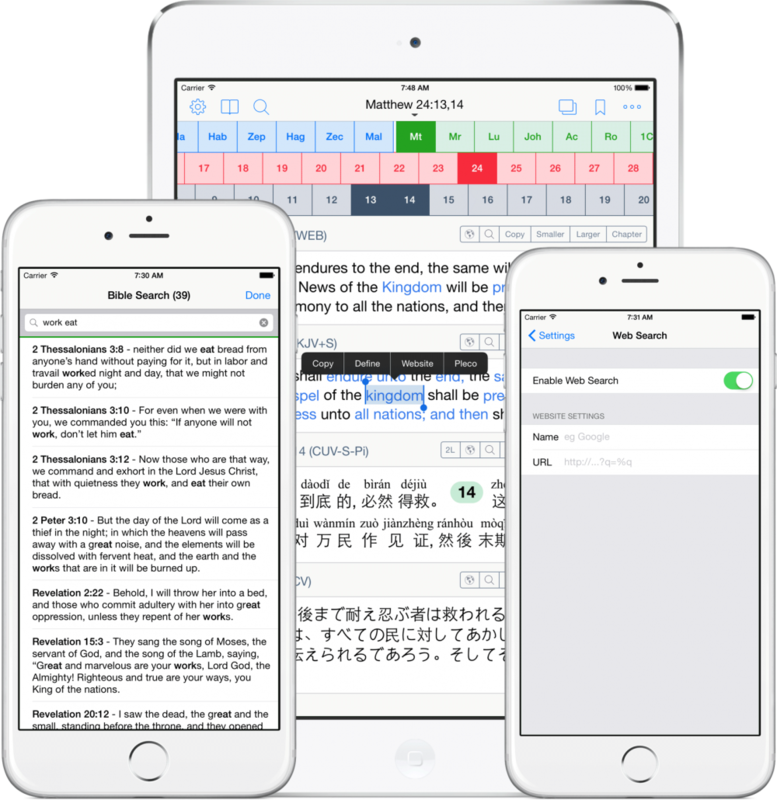 Once you have imported your EPUB files you can change the display order of the Bibles, turn them on/off, and edit the Bible settings such as the Bible name, abbreviation and language. You can also set your “Preferred Bible” which will be used to show scripture extracts in your Bookmarks and other places. 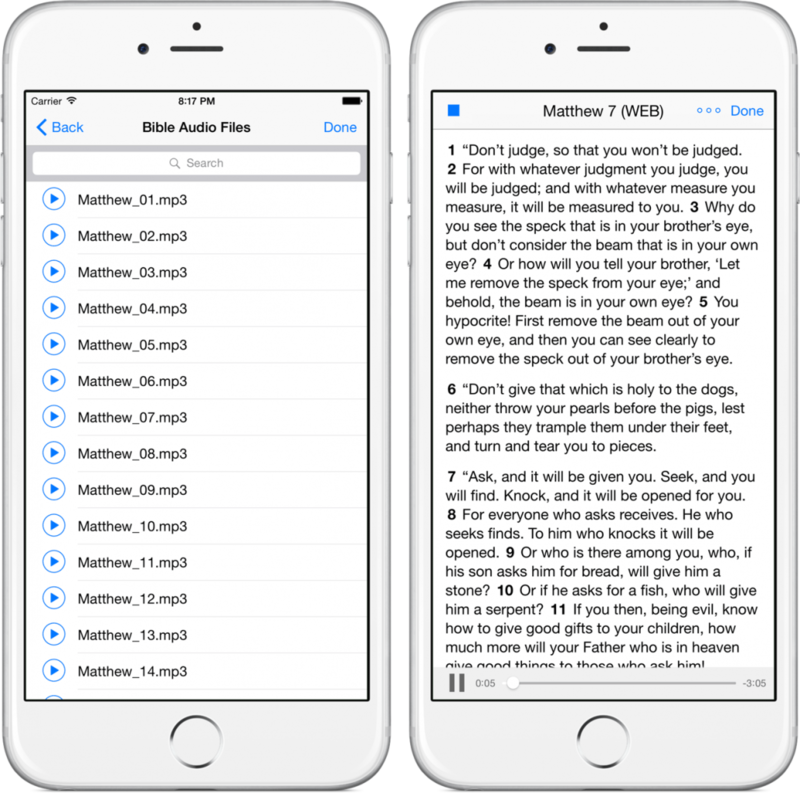 Want to compare multiple Bible translations? Or view multiple languages side-by-side? The Equipd Bible was designed from the ground up for reading multiple Bibles in parallel. And not just a single verse, but any combination of verses within the chapter. Great for personal study, or ministry work, and especially for those learning a new language. You can also jump into the full Chapter window and then double-tap (or optionally triple-tap) to switch left/right between the Bibles while in the Chapter view. And if you only want to use a single Bible – and don’t care about the side-by-side view – you can just disable all Bibles except one, and you will enter the Single Bible Mode. This will display each chapter full-screen – and you can swipe left/right to switch between chapters. See the little black “down arrow” in the middle of the top toolbar under the current scripture name? Tap the scripture to open the Bible Picker to quickly lookup the Book, Chapter and Verse from a full-screen layout. Great for quickly jumping around different books of the Bible. The 3x scrollers along the top of the window for Book, Chapter, Verse are optimised for quickly navigating within a smaller section of the Bible – such as jumping between the Gospels or changing chapters. 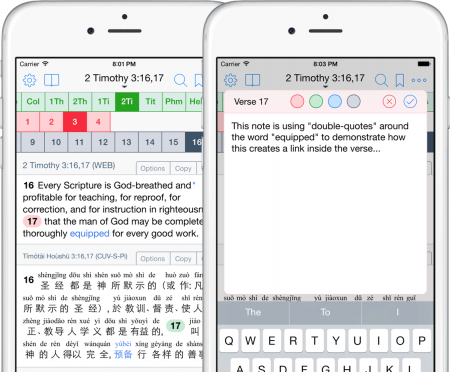 Try tap-and-hold to select a range of verses, or tapping the chapter button to unset the already selected verses. 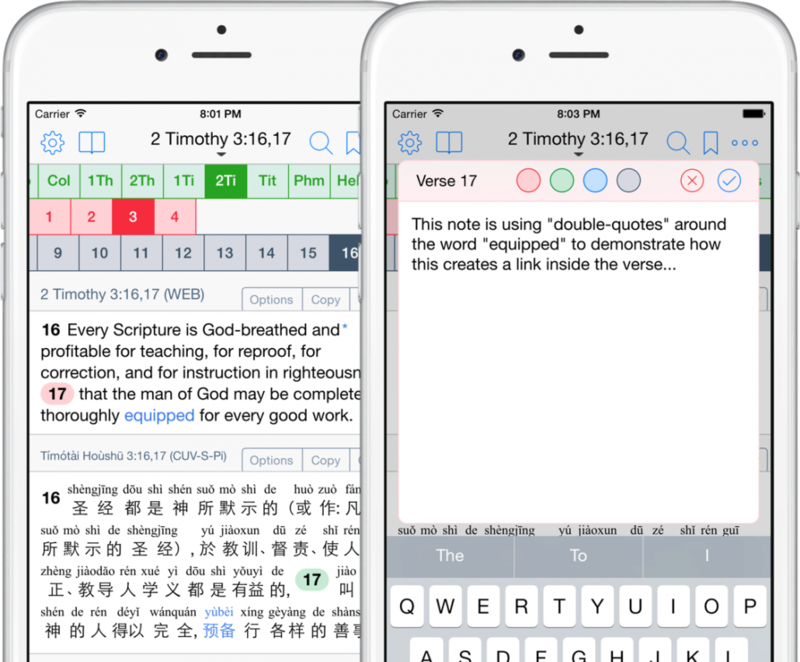 If this feature is turned on, then you can copy a scripture reference from another app, and then switch to Equipd – and Equipd will detect the scripture in the clipboard and try to open it for you. * In Landscape on the iPhone the screen layout has been optimised and the book scroller will disappear. You can double-tap to display the full-screen Bible Picker to change books. Just tap on a verse number to add a Note to that verse. So easy. Choose between four different note colours – maybe you use a different colour for Bible Highlights vs points for personal application vs ministry points. You can even create links within the verse from the Note. Simply use “double-quotes” around words or phrases that are found in the verse, and Equipd will create a link on that word or phrase that will open the note. NEW! 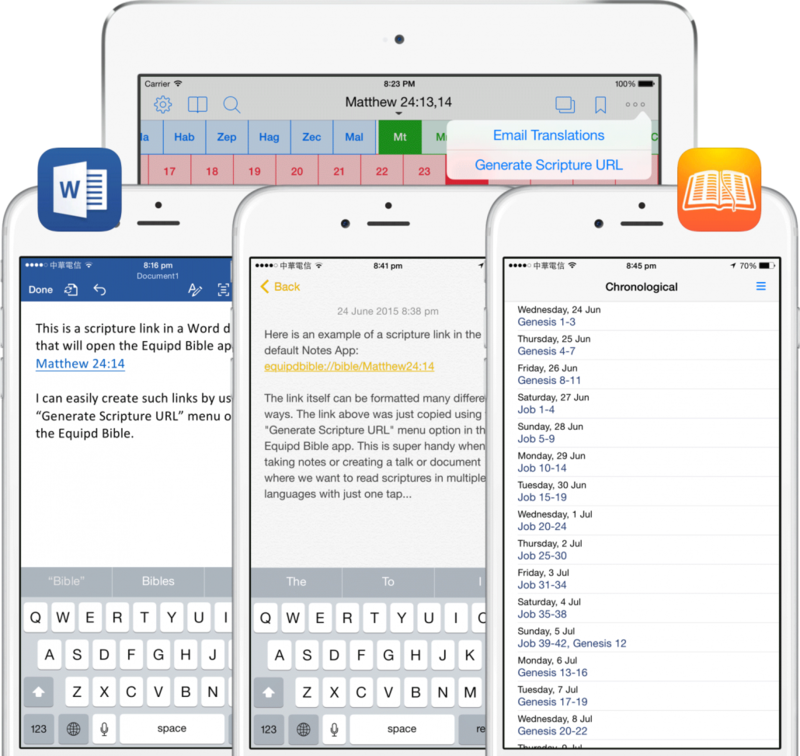 Support for Formatting (bold, italics etc), Highlighting, and the ability to cross-link to other scriptures, apps, or web addresses from within a note. Equipd supports offline MP3 audio. Now you can listen to a chapter being read aloud. Note that you must be viewing a complete chapter in Equipd in order to play audio – so if you are in the side-by-side view, then click the “Chapter” button above the verses on the right to open the Chapter window. If Equipd cannot automatically locate the audio file for the chapter, then you may be asked to manually select the audio file to play. This way Equipd caters for MP3 files that are not using a standardised naming convention. You can easily bookmark scriptures – organising bookmarks by topic or category, or saving a scripture as a “Favourite”. Simply tap the Bookmark icon top/right and select a Topic, or add a new Topic from this screen. To view your existing Bookmarked scriptures, click on the Book icon in the toolbar (left), and select Bookmarks. Click on a Topic or category, and you will see your favourite scriptures listed, complete with the extract. Simply tap a scripture to open it, or share all your scriptures in this category with a friend from the menu. The scripture extracts come from the EPUB you have defined as your “Preferred Bible”. From the same Book icon on the toolbar you can view a history of recently viewed scriptures. Any EPUB that has the language set to “Chinese” can have Pinyin, Zhuyin (Bopomofo), Sidney Lau or Yale romanisation automatically rendered for the verses by Equipd. 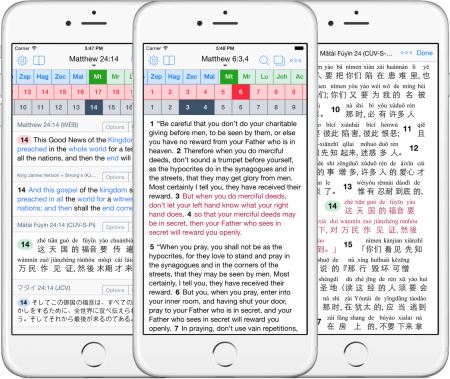 And you can enable these as separate Bibles – so that you can view the Characters only version and the Pinyin version side-by-side if you wish. 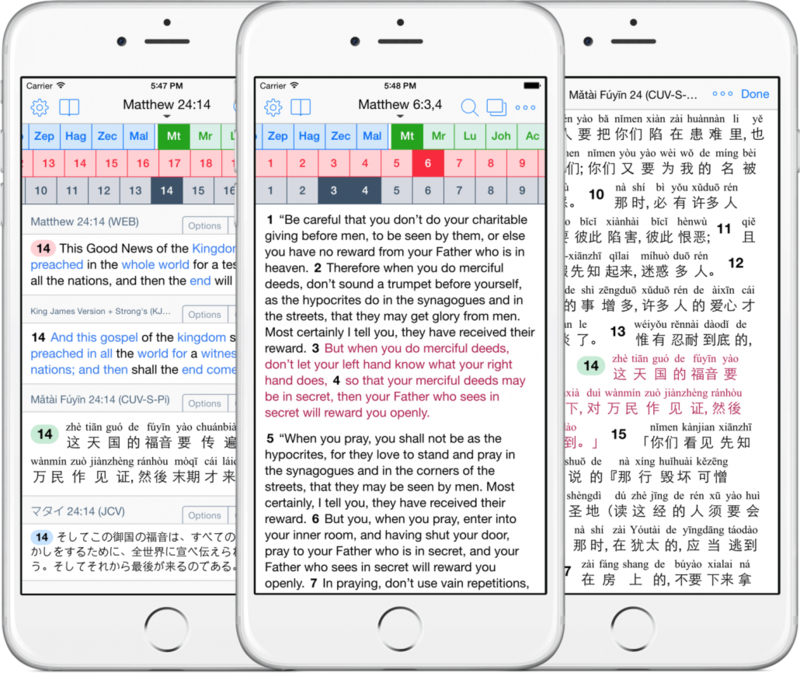 By default Equipd will show the verses in 2-Line mode, with the Pinyin above the characters. But you can toggle this on/off to just show the Pinyin without the characters – it is up to you. 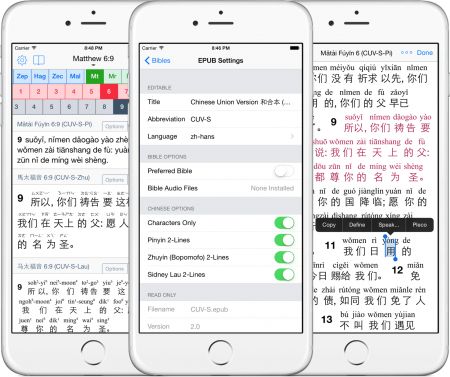 Courtesy of spending time in Taiwan where Traditional characters are standard, the Equipd Bible allows the viewing of Pinyin, Zhuyin, Sidney Lau or Yale above Simplified OR Traditional characters. A unique and powerful feature. If you have the Pleco app installed on your device then Equipd will provide a menu option for you to define selected words in Pleco, and then jump right back to Equipd. 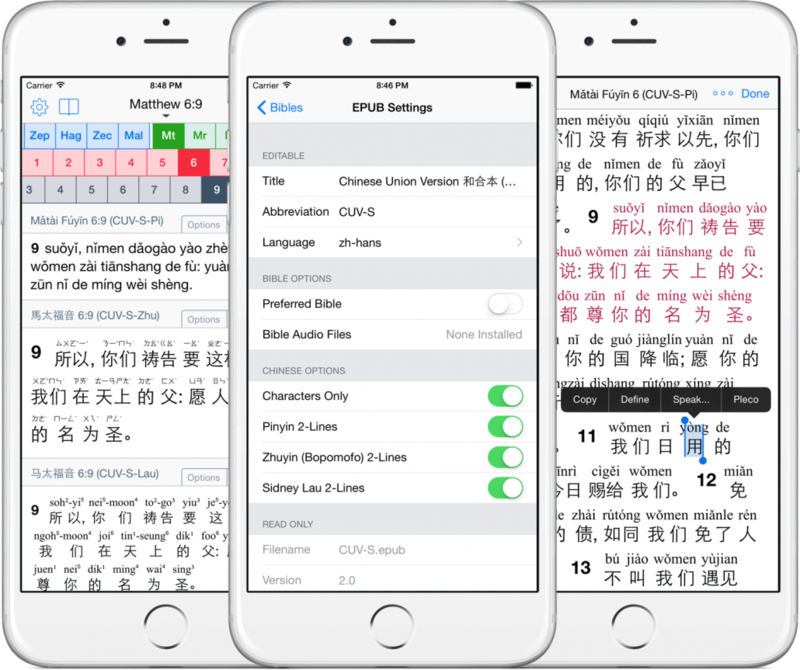 You can also set your Bible Navigation to Chinese with Pinyin in the Bible Settings. Especially handy on an iPad where you can set the Bible Picker to full-screen and you will see the Bible Book Names in Pinyin. 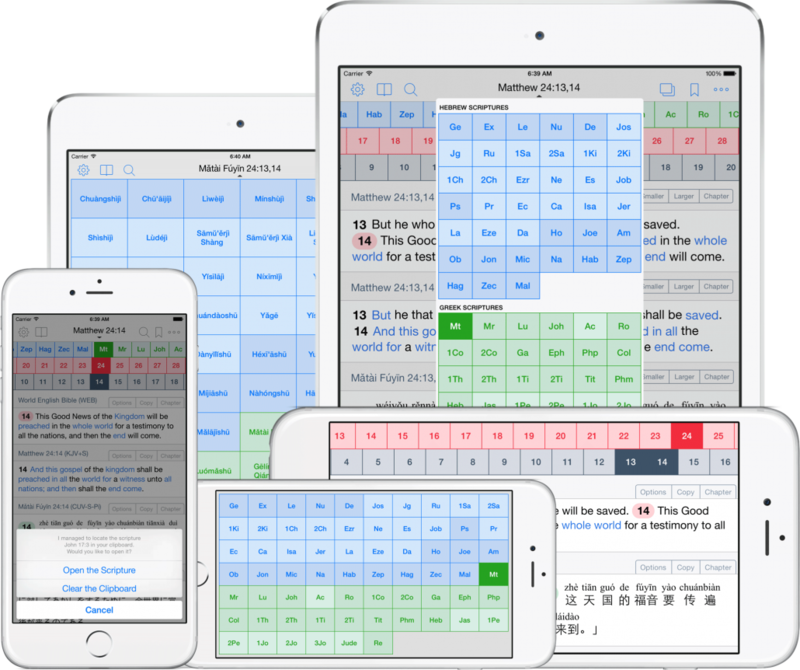 Use the Bible Search to find a word or phrase. You can use disparate words in a verse – for example searching for “work eat” will locate a scripture such as 2 Thessalonians 3:10 (WEB) – “If anyone will not work, don’t let him eat.” Depending on your device you can search your Preferred Bible (defined in Settings) from the top toolbar, or any of the side-by-side Bibles by using the buttons above the displayed verses. You can also enable a Web Search in Settings – this allows you to search a website for a scripture or any selected text in a verse. This is really handy for doing additional research on websites such as WOL.jw.org or other Bible study resources. Turning this on will add a new button above the displayed verses, and a new popup menu option when you manually select text within a verse. 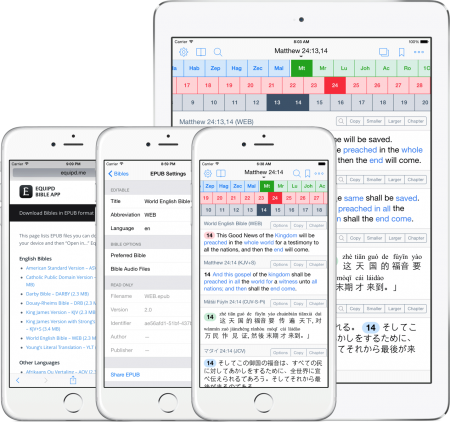 Equipd Bible offers a full-featured URL Scheme so that you can perform scripture lookups in the Equipd Bible from other apps. Developers can take advantage of the supported x-callback-url standard to allow their app to open scriptures, and then jump back to their app. Users can create scripture links in documents that will then open in Equipd. For example, apps like Microsoft Word or the default Notes app will support scripture links to the Equipd Bible. And other apps that support URL schemes can be customised to work with Equipd. For example the ReadingPlan app provides Daily Bible Reading Schedules. Simply add the Equipd Bible link to ReadingPlan and then when you click a scripture in a ReadingPlan schedule it will open Equipd. NEW! Equipd Bible now has inbuilt support for Bible Reading Schedules. Learn more about this powerful new feature here.